Documents a pain in the neck? Neck pain and headaches are common problems for computer users. Why? One of the reasons is the rotated and flexed neck postures needed to look at printed material flat on the desk (usually left of the keyboard). This head and neck position is often done so repetitively it causes pain on the left or right side of the neck and into the neck/shoulder region. Most computer users are aware that the screen should be at the correct height for good head & neck posture. What is equally important is good positioning of papers and printed material which are referred to while using the computer. Printed reference material is often placed to the side of the keyboard (usually the left). Every time the head turns to read, the neck rotates and flexes; compressing and stretching delicate soft tissues. Over time, this can cause neck, neck-shoulder or upper back pain or injury. Not all document holders are made equal. The old style A4 size ‘portrait’ document holders were not all that useful because they only held a few pieces of paper. 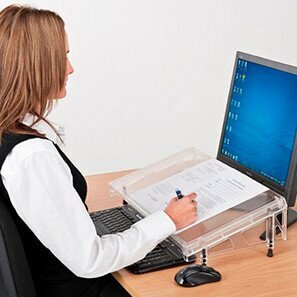 The new generation of document holders are larger, ‘landscape’ shape and designed to fit between the keyboard and monitor. Usually this is an unused area of the desk but is the best place for reference material because papers can be viewed with only minimal eye movement and a little head tilting. These larger, stronger document holders support large files, piles of papers or even heavy books. With an ‘inline document holder’ the eyes move in a gentle arc from keyboard, to document holder, to screen. The head sits balanced over the body and the neck safely moves within the mid-range. 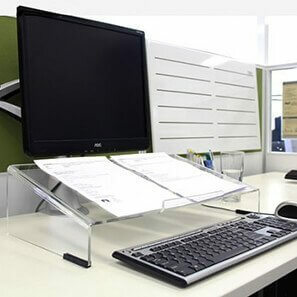 Some styles of document holders (Docslope, Microdesk & Over Keyboard stand) can slide forward, over the keyboard to become an angled reading/writing platform or alternatively the keyboard can be slid underneath to make a clear working space in front of the body. It’s like adding a mezzanine to your desk. If you read printed material while using a computer a document holder will make a huge difference to your workplace wellness.